RAF Swinderby was located to the south of Swinderby village, adjacent to the A46. Although the airfield opened shortly after the outbreak of WWII, it was unfinished and still grass-surfaced. Originally it was intended to have ‘C’ Type hangars but due to austerity measures, Swinderby was provided with three ‘J’ Type hangars. The technical and living accommodation followed the expansion pattern, being grouped togather east of the airfield, bisected by a public road. Swinderby was allocated to 1 Group and in August 1940, 300 (Mazowiecki) Squadron and 301 (Pomorski) Squadrons arrived on the twenty-second and tenth-ninth respectively. Equipped with Fairey Battle aircraft, they converted to Wellingtons later that year. 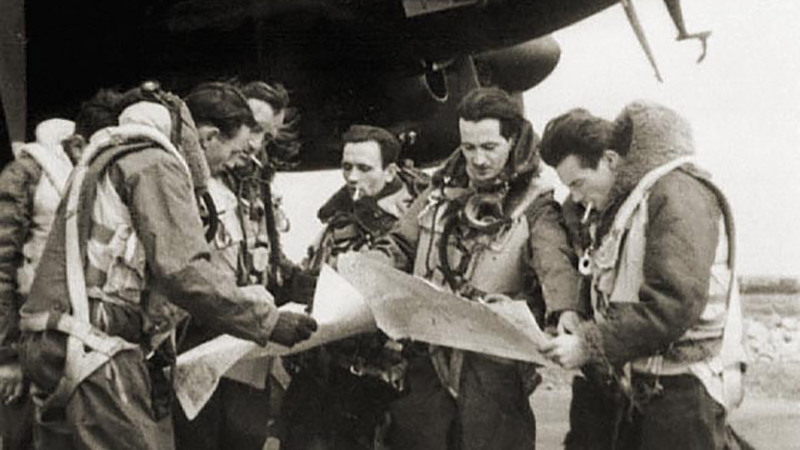 The two squadrons were the first Polish manned in the RAF and stayed at Swinderby until 18 July 1941, when they moved to Hemswell, in 1 Group. Swinderby transferred to 5 Group and on 20 July 1940, 50 Squadron equipped with Hampdens, arrived from Lindholme, South Yorkshire. The squadron operated from Swinderby until 26 November, when the deteriorating state of the grass forced a move to Skellingthorpe, allowing construction of concrete runways. On 6 June 1942, 455 Squadron RAAF (Royal Australian Air Force) was formed at Swinderby but it was not until 1 September that personnel arrived. The airfield was reopened in June 1942 after three concrete runways were laid, although initially shorter than Class ‘A’ standard, they were later extended. To the north of the technical site, in addition, three T2 hangars were provided and aircraft dispersals increased to 36. To expand the accommodation, three dispersed sites were constructed in countryside towards Thurlby. On 20 June, 50 Squadron, now equipped with Lancasters, returned to resume operations. They stayed at Swinderby until 16 October, when they returned to Skellingthorpe. Following the departure of 50 Squadron, Swinderby was selected as a training airfield, with 1660 HCU (Heavy Conversion Unit) forming there. The station transferred to 7 (Training ) Group in November 1944, and the HCU remained at the airfield into 1946. Swinderby was retained by the RAF and continued in its training role, until closure in 1993. The airfield was put up for sale in 1995 and today comprises housing and a business park.